Spring is here! And, I'm finally back to blogging (I know it's been awhile) and I have a special offer to share at the end of this post. I'm always stoked when I have something helpful to share and I'm especially pleased to be writing about the subject of bioenergetic testing. This post might sound a little out there, but bioenergetic testing has been a useful modality I've found for solving pieces of my health puzzles. 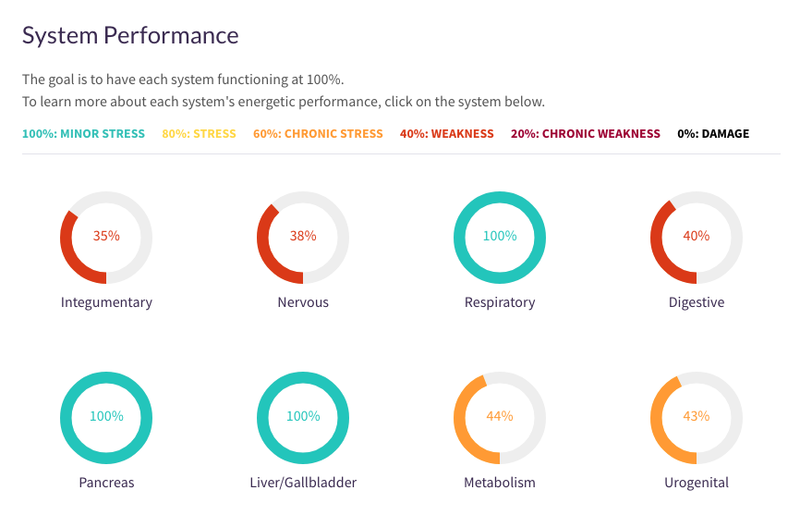 What is bioenergetic testing? Also called electrodermal screening, or bio-resonance testing, it's an energy medicine modality based on the premise that the body has energy points where the health and function of different organs and systems can be measured via electrical frequencies/resonance. In the case of bioenergetic testing, these points are tested by running an electrical current through a wand that touches the point (usually on the hands and feet), and runs energy through the meridians and measures bioelectrical resonance. Each resonance is compared, in a computer program, against the recorded resonance pattern of a healthy organ or system to see if that organ indicates stress or hypo-functioning. Another function of bioenergetic testing is measuring the resonance of nutrient deficiencies, substances like foods and environmental factors that resonate as "sensitivities", pathogens, hormones, and toxicity. Once all of this is tested, then the resonances of different supplements are tested against it to see what brings balance and resolution. This article gives a good overview of the history and process of the technology. 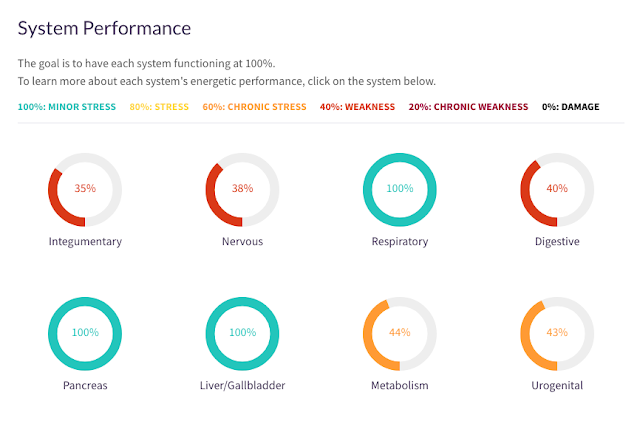 I've had bioenergetic testing done over the years when I was having mystery symptoms that seemed viral and it was very helpful in identifying pathogens. One odd symptom that I was able to resolve was tooth sensitivity that had no apparent cause. It was determined to be stemming from my submandibular lymph nodes, where a virus had apparently taken up residence. Lymphatic drainage provided some relief, but taking the remedies that scanned as appropriate was what resolved it quickly. 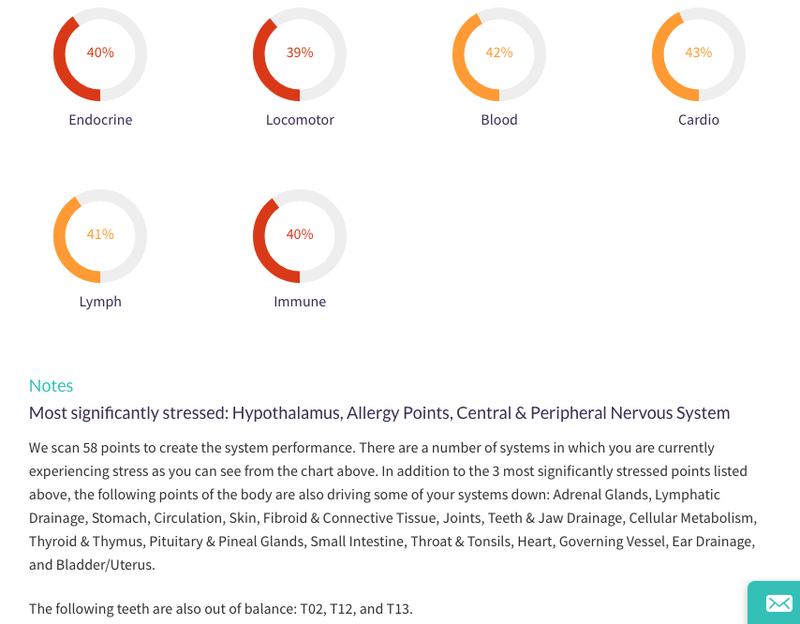 In the fall of 2016, I was approached by Balanced Health, a long distance bioenergetic testing company, to try out their Full Scan Kit, where you submit a saliva and hair or nail sample and they're able to use those to scan from. This is different than hair mineral analysis or saliva testing. I wasn't sure if this particular way of doing it would be legitimate, but I was curious to compare it to my past bioenergetic testing experiences and I rarely pass up a free chance to try something intriguing. They made it clear I was under no obligation to write a review, so this is not a sponsored post, just my honest, personal experience with the product. 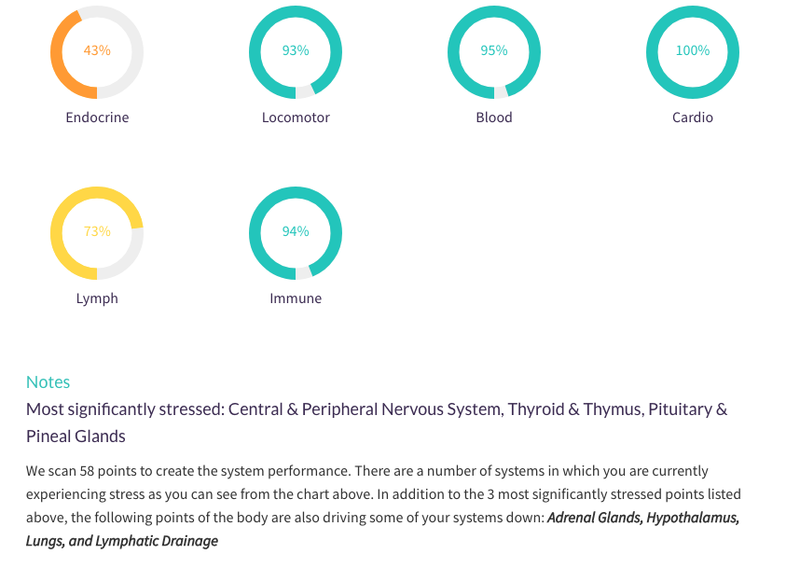 The Full Scan includes a lot of information, including the resonances of system/organ performance, nutrient balance, hormones, pathogens/toxins, and food/environmental sensitivities, as well as a regimen of recommended remedies. You can check out an example of a full scan here. Note: bioenergetic testing is not a replacement for traditional blood tests and diagnostics, but can provide helpful info in addition to traditional functional medicine testing methods. I was curious to see how the info it generated would match my known issues and past blood test results. Here are some of my first scan results, from September, 2016. At the time, I had started having the tooth sensitivity issue again, after years of no issues. I was impressed to see that it pinpointed "teeth and jaw drainage" as one of my issues. My adrenals have always been a weak area and, having Hashimoto's, it's not surprising that my thyroid showed up. 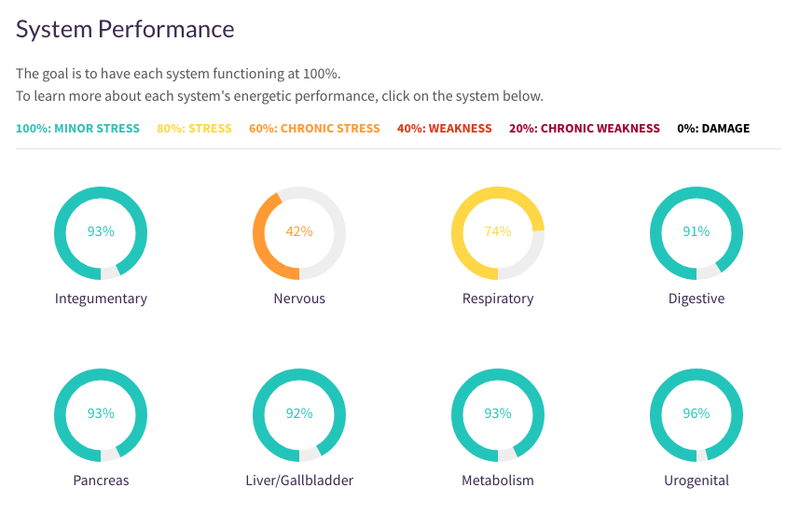 My system showed a lot of chronic stress and weakness. You can see that there is improvement across the board! In every scan I've had, my endocrine and nervous systems have been the slowest to improve, indicating that those are deep seated issues for me, which is not surprising, considering that I have an autoimmune endocrine disease and I've always had a sensitive nervous system, with an imbalanced parasympathetic response according to my EEG brain mapping back in my neurofeedback tech days. At the time of this scan, I had a little respiratory thing going on, which is reflected in my reduced lung score. 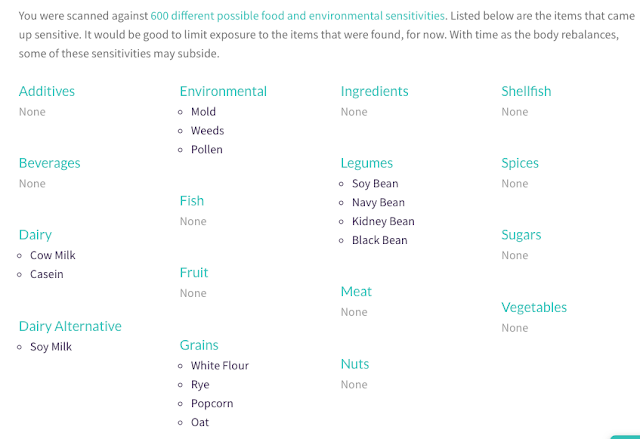 One area I was very curious about was what energetic food sensitivities would show up. All of my scans have consistently shown soy, dairy/casein, and gluten as sensitivities (these have also been confirmed by Cyrex Labs tests), and various legumes always show up. They change slightly every time, but the pattern is there that indicates my body doesn't jive with legumes. Corn also always shows up and oats have frequently shown up. 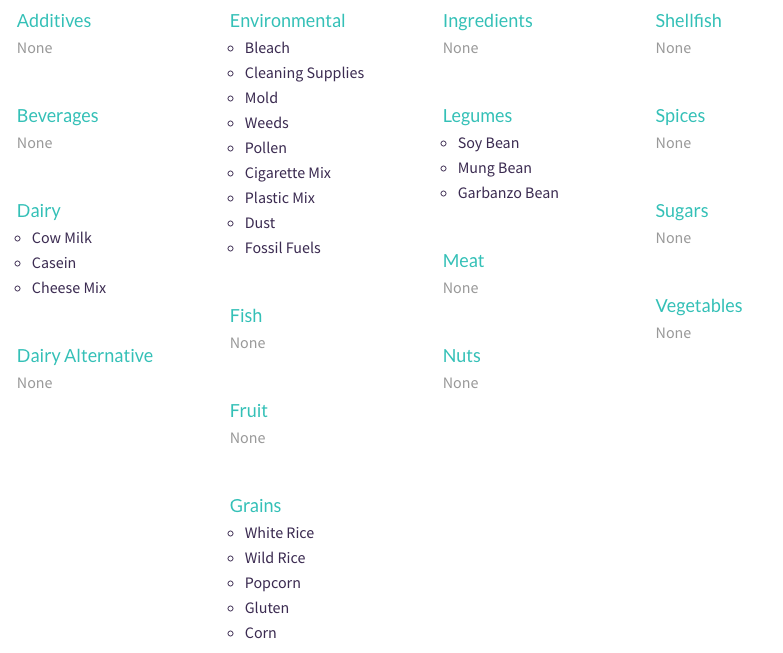 No nightshades, gums, spices, nuts/seeds have ever resonated as sensitivities and, indeed, I haven't had issues adding these back into my diet after AIP. Balanced Health states that if foods you haven't eaten in a long time show up consistently, they are likely more serious sensitivities. I always test as needing digestive enzyme support, so I've been faithfully taking Now Super Enzymes with meals, and the resonances of vitamin and mineral imbalances have disappeared, leaving just a few fatty acids and rotating amino acids that appear. Balanced Health doesn't list specific pathogens on the "Energetic Toxins" portion of the test, but you can request that information during the follow-up phone consult that comes with the scan. Being the curious type, I always asked for that info. I rarely had the same viruses or bacteria come up more than once, indicating that they were being cleared by the protocols. I did have a few of the same molds show up. No resonances of parasites or metals have ever shown up for me and this is consistent with past scans I've had from other practitioners. Balanced Health has a variety of scans and scan packages to choose from. The Full Scan, as well as the Balancing Scan (which has less info than the Full), and Remedy Scan (no info- just remedies) all come with a remedy protocol generated uniquely for you, based on which remedies bring about energetic resonance balance. I've found the remedies to be effective (especially the adrenal formulas I've used). I get most of the products directly from them, as the homeopathic and herbal blends are very specific and can't be found in other brands. If a simple supplement like a single amino acid shows up, I usually buy it elsewhere to save money, taking care to match the dosage. Each scan includes a follow-up phone consult to discuss your results and answer any questions you might have. The consultants are the nicest folks and I always enjoy the consult. They will also ship kits overseas and work with you to find supplements locally. I've been really pleased with the health progress I've made since utilizing the scans and remedies. I still have ups and downs, but have had more ups and seem to bounce back much faster. I recommend starting with a Full Scan to get a baseline measurement and you can alternate with less expensive scans like the Remedy Scan to make continuing the protocols less expensive. I can say that I highly recommend Balanced Health and have had a great experience with them. I'm pleased to be able to offer my readers an affiliate discount code for $20 off of any scan- this code is ongoing, so you can use it any time you order a scan, not just the first time. :) The code is "prettyinprimal"
I hope that that you've enjoyed this post. I look forward to posting again sooner than later.